A luminary of American literature canon. 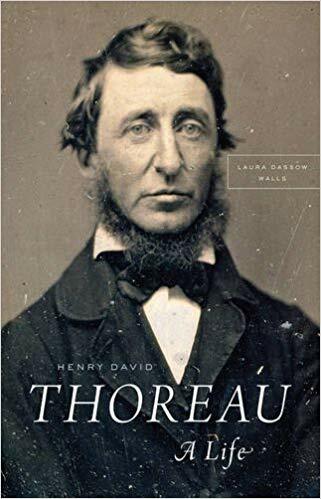 A Life is more than a mere biography – Dr Laura Dassow Walls integrates Thoreau's life with his writings and thereby highlights his naturalistic and scientific interests in historic context. As a result, Thoreau emerges very vividly as a personality with family, friends, business responsibilities, humour, a courage, and an insatiable curiosity. A splendid life-affirming paen to the sage of Walden Pond fame that makes it obvious that the author Walls is a fan of Thoreau and his oeuvre. The depth of her research makes possible the kind of detail which matters in a biography. Wall details Thoreau's intense interest in science, and some of his discoveries, notably about forest succession. For me A Life also unveiled that Thoreau wrote far more than what the mainstream is aware of, especially in his journals. His "Walking" and "Slavery in Massachusetts" are outstanding examples. I had not known about the posthumous discovery and editing of his final book, Wild Fruits, which Walls mentions repeatedly, though I had to go to her notes to find that it was actually published. In a world with many lengthy and plodding biographies that do not really advance the story of the subject in a meaningful way, this one is an exceedingly well written book that gives a thorough and well-paced accounting of Thoreau, his surroundings, circle of friends, family and influences. A first-rate piece of work and I would highly recommend it to anyone with even passing interest in its subject as Walls bringing together the facts of his life and times, the places he has been, his friends and acquaintances as well as his influences on those around him helps to see a fuller version of the complexity and development of this writer, prophet, sage. An expertly written recount of Thoreau's manifold activities that carefully manages to not overwhelm the reader. No matter if you are a Thoreau novice or even an expert, this is the biography you want to read. It is not only informative but pleasant to read as one encounters the author's numerous perceptive insights.